Malaysians can now shop for fresh goods and other grocery items online as 11street (www.11street.my) is introducing an array of fresh produce on its platform. Through a partnership with Just Order Conveniently On Mobile (JOCOM), consumers can get fresh goods such as vegetables, fish, halal-certified organic farm chicken, eggs and white bread from 11street. The initiative will be rolled out gradually, with Klang Valley shoppers being the first to receive their fresh foodstuff within 24 hours. Consumers in Penang and Johor Bahru will enjoy next-day delivery by the end of the year, while those in other Peninsular Malaysia states, within next year. 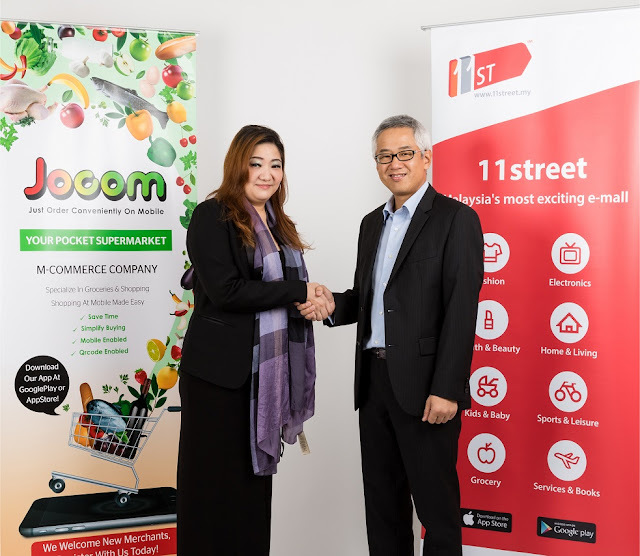 “We are delighted to have JOCOM supporting our vision in bringing fresh produce to our shoppers, working towards establishing 11street as a one-stop e-mall that offers everything our shoppers need under one roof. This is in line with the growing interest among Malaysians to turn to the digital sphere to shop for fresh food and other household grocery items. We see this increase especially during festive periods, such as Hari Raya and Chinese New Year,” says Hoseok Kim, Chief Executive Officer of 11street. To kick start 11street’s foray into offering fresh produce, shoppers can now purchase the two items – 10 pieces of the Grade C eggs and Gardenia Classic White Bread – each for RM1 with limited units. The newly-minted collaboration will see the addition of 1,000 fresh produce from JOCOM into 11street’s inventory by of this year. On top of the fresh harvest of vegetables and farm chicken, as well as eggs and nutritious bread, shoppers can also shop for frozen food items such as fish and other seafood, thus elevating one’s shopping experience on 11street. Other grocery items available through 11street’s existing partnership with JOCOM include household items such as laundry detergent, toilet rolls, and air freshener; furniture such as recliner chairs, cushions, and bean bags; as well as condiments for cooking such as sesame oil, sauce marinades and canned foods. With the introduction of these fresh foodstuffs into 11street, shoppers are assured of the freshest and highest quality food items. In the event that shoppers find these items unacceptable, 11street will redeliver products within the next 24 hours, or provide a full refund. As it is a phased roll-out, 11street and JOCOM will extend the 24-hour delivery option for fresh foodstuff to shoppers in Penang and Johor Bahru by the end of this year and the rest of Peninsular Malaysia by early 2017. In the near future, 11street and JOCOM aim to achieve at least 15,000 fresh goods orders on the former’s platform. Kim elaborates: “We hope that through this collaboration with JOCOM, we help to make our shoppers’ lives more convenient by enabling them to shop for essential food products and household items on 11street. Our aim has always been to enrich and expand our offerings so that our shoppers continue to find everything they love on 11street. “With our vision in mind, we are also excited to let our consumers know that we will offer one of Malaysia’s most highly valued and rare freshwater fish – the empurau – caught fresh and flown in specially from Sarawak, and sold frozen,” he concludes. The empurau fish sells from RM700 per kilogramme onwards, and is available exclusively on 11street starting today.